CFCs are responsible for much of the damage that has been caused to the Earth’s ozone layer in the past 50 years. Thankfully, due to the work of Mario Molina and others, their disastrous effect on ozone was recognised and following the discovery of a hole in the ozone layer in 1985, the Montreal Protocol was born. 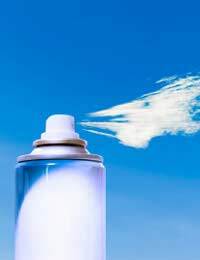 An international treaty covering the phasing-out of CFCs (chlorofluorocarbons)and other ozone depleting substances, the protocol was drawn up in 1987 and came into force less than two years later - on New Year’s Day 1989. The protocol was agreed following an environmental agreement known as the Vienna Convention for the Protection of the Ozone Layer and it covers in total, almost 100 ozone-depleting substances. In developed countries, the use of CFCs has now dropped by around 75% and by 2010, their use should have been completely phased out. Halons, also covered by the protocol, are no longer developed in most countries but can continue to be used from stockpiles until 2010. Use of carbon tetrachloride (mainly in industrial cleaning agents) stopped in most developed countries in 1996 but its use in feedstock is still permitted since this is responsible for only very low emissions. HCFCs were introduced as a short-term replacement for CFCs since they are less damaging to the atmosphere, but they are also due to be phased out in developed countries over the next 22 years. Methyl bromide, used in agriculture, was added to the list of substances covered by the protocol in 1996. However, until an alternative can be found, its use is still allowed under a critical exemptions loophole for certain purposes involving quarantine. Strangely, bearing in mind that former UN secretary general Kofi Annan, has referred to the Montreal Protocol as ‘perhaps the single most successful international agreement to date’, many people in the UK have not heard of the agreement. Originally signed by 25 countries, it now has more than 191 signatories. It has been amended and strengthened on a number of occasions and research suggests that its introduction has had a big impact on the earth’s ozone levels. Although the ozone hole of 2006 was the largest ever – partly due to weather conditions – global ozone levels have remained almost static for the past several years – and most experts believe this is due largely to the Montreal Protocol. The news that ozone is no longer being depleted to the extent that it was, is obviously excellent news for our planet – and us. Experts predict that unless something else happens to cause ozone levels to begin falling again, the Antarctic ozone hole could be permanently repaired sometime within the next 35-70 years. Of course, it isn’t only CFCs and other manmade substances that deplete the earth’s ozone. Some natural causes, such as volcano eruptions, also deplete our ozone but scientists believe that most of the damage over the past half century is down to us rather than natural events. And one of the problems we still face is that some developing countries lack either the finance or the technology to implement cleaner and safer alternatives to CFCs and other ozone damaging chemicals. In some countries, CFCs are still illegally traded and the Environmental Investigation Agency wants greater priority given to the issue.